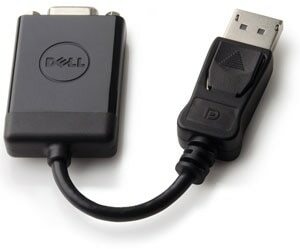 The Dell™ DisplayPort to VGA adapter lets you to take video content from your laptop or desktop and display it on any monitor, projector or HDTV featuring a VGA input. This user-friendly adapter supports a maximum video resolution of 1920 x 1200 and ensures a quality viewing experience. The adapter can be used to enjoy movies on a home projector, mirror your desktop for an expanded workstation or show presentations at school or work. The versatile Dell DisplayPort to VGA adapter enables you to view video content from any laptop or desktop with DisplayPort (DP) video output on a variety of VGA-compliant displays, ranging from monitors to projectors. Compliant with DisplayPort specifications version 1.1a and supporting a maximum video resolution of 1920 x 1200, this user-friendly adapter ensures a quality viewing experience. This video adapter allows you to take video content from your laptop or desktop and display it on any monitor, projector or HDTV featuring a VGA input. As long as your device is equipped with a DP output, this compact adapter ensures a seamless conversion. Use it to enjoy movies on a home projector, mirror your desktop for an expanded workstation or show presentations at school or work. 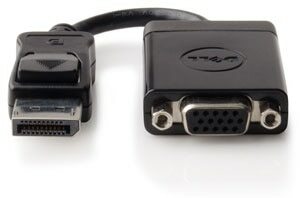 The Dell DisplayPort to VGA adapter supports video resolution of up to 1920 x 1200, making it an ideal for enhanced presentations and intricate graphics. Measuring 7 x 0.5 (L x H) inches, this plug-and-play adapter is easy to use and keep handy for impromptu presentations for clients or movie nights with friends. The adapter is fitted with a DisplayPort on one end and a 15-pin HD15 VGA on the other, a standard fit for a wide variety of VGA compatible display monitors, projectors and HDTVs. The adapter is compliant with DisplayPort specification version 1.1a, ensuring true DP quality when video content is adapted and viewed. DisplayPort 1.1a specifications allow there to be a longer reach between source and display without reducing picture quality. Purchase with confidence and rely on the protection of a 1-Year Limited Hardware Warranty1 from Dell and 1-Year Advanced Exchange Service2 for your Dell DisplayPort to VGA adapter. 2 Advanced Exchange Service: Replacement part/unit dispatched, if needed, following completion of phone/online diagnosis. 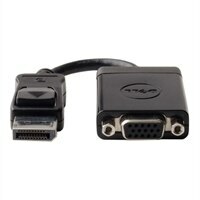 Dell DisplayPort to VGA adapter.